Frederick, MD – More than 110 people filled the Delaplaine Visual Arts Education Center for the Tourism Council of Frederick County’s annual membership meeting last night. In addition to a review of tourism efforts over the past year, the Tourism Council announced the major milestone of reaching more than one billion dollars cumulative gain in visitor spending over the past 15 years. “That extra billion dollars not only benefitted businesses where out-of-town visitors spent their money, but with hundreds of millions in tax dollars paid, every county taxpayer has benefitted from extra funds going to local services,” said Sean Quill, current board president for the Tourism Council. In 1999, the Board of the Directors for the Tourism Council of Frederick County developed a long-range plan with three major goals: 1. Put more efforts and funds towards marketing Frederick County as an overnight visitor destination, 2. Develop a new visitor center to better accommodate groups and house exhibits and a film, and 3. Capitalize on heritage tourism, especially with the 150th anniversary of the Civil War and the 200th anniversary of the writing of the Star-Spangled Banner. Throughout the evening, renderings of the proposed full-service downtown hotel, the Marriott at Carroll Creek were available to view on easels around the room. Elizabeth Cromwell, president of the Frederick Chamber of Commerce, and Richard Griffin, director of economic development for the City of Frederick, addressed the attendees about the proposed plans for a downtown hotel with a restaurant and conference center. Margot Amelia, executive director of the Maryland Office of Tourism, was the keynote speaker for the annual meeting. Amelia reviewed the progress made by the state tourism office and the areas in which Frederick County has surpassed the state’s tourism growth as a whole. She shared a video about the state’s new marketing efforts with Miles Marketing, including a new website and the 2015 Destination Maryland visitor guide. Several generations of the Irons Family were recognized with a special log cabin award for “50 years of hosting happy campers.” The family owns and operates Ole Mink Farm campground in Thurmont and celebrated their 50th anniversary in business this past July. Attendees enjoyed a video detailing the history of the campground since its start in 1964. J. Ronald Pearcey was named as the Tourism Council’s Tourism Ambassador of the Year for 2014. Pearcey has been the Superintendent of the Mount Olivet Cemetery for nearly 50 years. He often serves as an impromptu guide for visitors seeking information about the cemetery’s great historical and heritage resources such as the Francis Scott Key Memorial, Confederate Row, World War II Monument and the graves of Governor Thomas Johnson, Barbara Fritchie, and Claire McCardell. Over the past few years of planning efforts for the Bicentennial of the War of 1812, Pearcey has been at the forefront of cemetery-related ceremonies and special events, building the relationship between Francis Scott Key and Frederick City and County. His leadership with the Francis Scott Key Memorial Foundation helped make two major interpretive grant projects a reality at Mount Olivet. 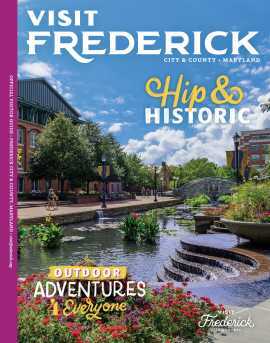 The Tourism Council of Frederick County (TCFC) is the recognized Destination Marketing Organization for Frederick City and Frederick County, Maryland. It operates the Frederick Visitor Center and related programs that include Destination Marketing and Group Tour Marketing. For more information about membership and the Tourism Council’s events, go to www.visitfrederick.org. 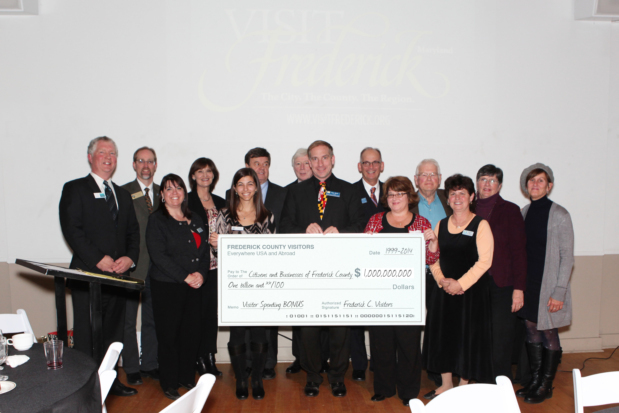 Photo Caption: Elected officials, tourism directors, and tourism partners pose with a giant $1 billion check to the citizens and businesses of Frederick County, representing the $1 billion cumulative gain in visitor spending over the past 15 years. Pictured, L->R, Back Row: John Fieseler, Executive Director, Tourism Council of Frederick County; Michael O’Connor, Alderman, City of Frederick; Margot Amelia, Executive Director, Maryland Office of Tourism; Ron Young, Senator, Maryland Legislature; Walt Stull, Councilman, City of Brunswick; Randy McClement, Mayor, City of Frederick; Carroll Jones, Councilman, City of Brunswick; Julianna Albowicz, Special Assistant, Office of Senator Barbara Mikulski (D-MD); Kelly Russell, Alderwoman, City of Frederick. Front Row: Angel White, Councilwoman, City of Brunswick; Melissa Joseph, Field Representative, Office of Congressman Chris Van Hollen (D-MD); Sean Quill, President, Tourism Council of Frederick County Board of Directors; Mary Pendergast, Past President, Tourism Council of Frederick County Board of Directors; Karin Tome, Mayor, City of Brunswick. 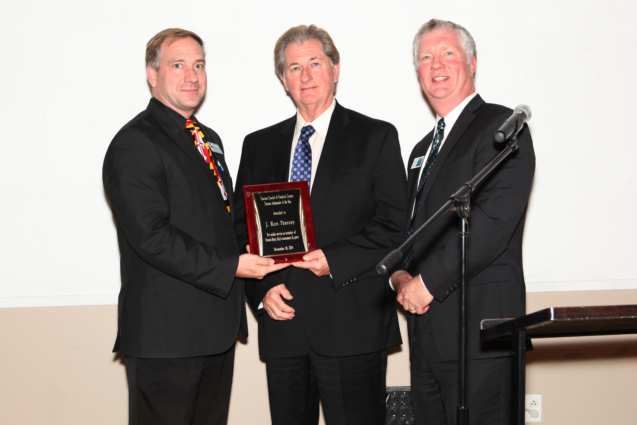 Photo Caption: J. Ronald Pearcey was named as the Tourism Council of Frederick County’s Tourism Ambassador of the Year for 2014. Pictured, L->R are: Sean Quill, President, Tourism Council of Frederick County Board of Directors; J. Ronald Pearcey, Superintendent, Mount Olivet Cemetery; and John Fieseler, Executive Director, Tourism Council of Frederick County.